One bowl, two spoons. Share dessert with your spouse—it’s sweet and cheap! Test-drive your fantasy car. Create memories and art together at a paint-your-own-pottery studio. 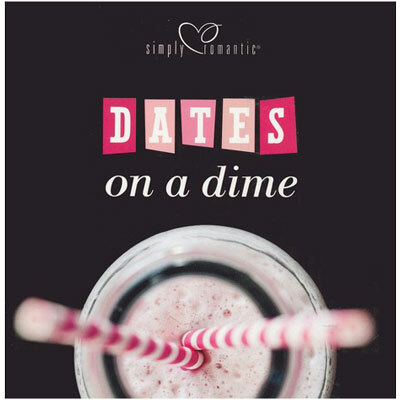 Dates on a Dime is full of simple, frugal date ideas and money-saving tips that help you stay under budget with over-the-top romance! Dates on a Dime contains 100 pages of helpful, practical, and creative ideas. With these simple, money-saving tips, you can plan a date that is full of fun and romance while staying under budget. The Simply Romantic® line of products is specifically geared toward married couples. From easy-to-use tips books, to planning an enchanted evening, to whisking your spouse off for a weekend of romance, these products will enhance any married couple’s romance quotient.